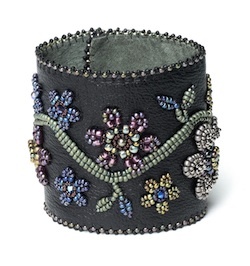 Fool for flowers By Tamara Scott The dramatic elements in this bracelet are stitched separately and then sewn to a suede or leather cuff and embellished with a few simple back-stitched swirls. Daisy chain By Huib Petersen This necklace is made by working a herringbone stem off a daisy head and them splitting the stem. Connect the ends of the split around the stem of another daisy to link them together. 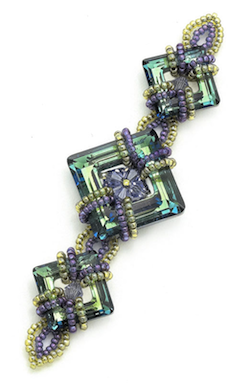 Exploring the angles By Cheryl Erickson Combine two-hole Tila beads with elongated magatamas and drop beads to make this fun geometric-yet-organic design. This bracelet goes together quickly so you can wear it right away. 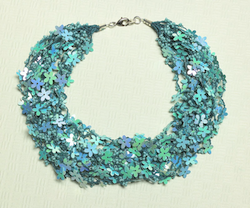 Floral abundance By Un-Roen Manarata An abundance of flower sequins float on airy strands of crocheted thread, creating a lovely, lightweight necklace with a bold but playful look. Artist Profile: From shop girl to glass girl By Ann Dee Allen Jennifer Geldard left the world of retail to become a full-time lampworker. 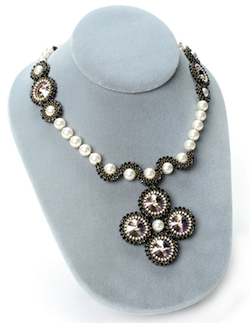 Belle of the ball By Cathy Lampole Made with pearls, crystals, and metallic seed beads, this rich embellishment makes any piece an instant classic. Attach two motifs for a beaded bead, line them up for a necklace centerpiece, space them along a netted bracelet band, or invent your own ways to flaunt them in your jewelry. Hogarth crystal curve By Wendy Lueder Work Russian spiral as flat, radiating rounds of crystals to create a necklace with a subtle nod to floral design. Cocktail cuff By Jane Danley Cruz Take a classic pearl cuff and embellish it with sparkling margaritas to create a glamorous right-angle weave bracelet. Point of connection By Anna Elizabeth Draeger Layer sparkle upon sparkle by filling in the spaces of these square Swarovski Elements. Use a few components for a smashing pendant, or link several to wrap around your wrist. Classic contours By Grace Nehls Intricate rings of cubic crossweave technique serve as bezels, a toggle clasp, and a curvy focal bar from which to suspend a pendant. Create a matching pair of earrings for an ensemble that is sure to please. 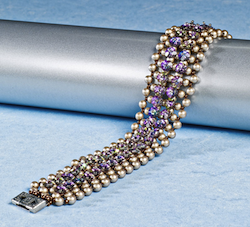 Circle meets square By Kathleen Burke Round out angular, bicone-studded beaded beads with crystal pearls to make a strung bracelet or earrings. 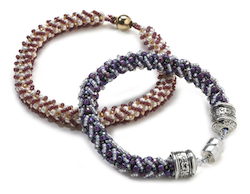 Power trio By Isabella Lam Embellish a supple spine of a cubic right-angle weave bracelet with sparkling seed beads. 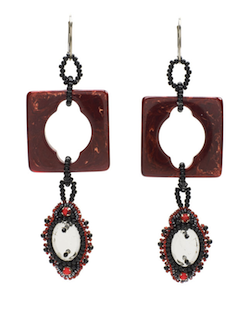 Bakelite delights By Suzanne Branca Combine bead embroidery with chunky vintage findings. Lightweight Bakelite is a perfect materials to use for earring designs. You get a heavy-duty fashion statement without the weight while preserving a bit of the past. 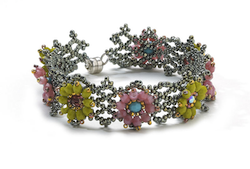 Retro daisies By Janice Chatham Build a netted base of lacy lattice with sparkling Charlottes. 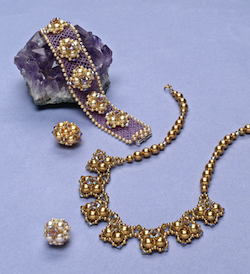 Then use fire-polished beads for the flowers. 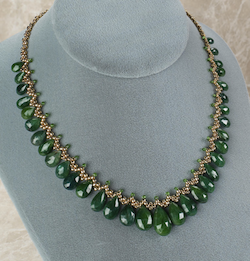 Queen of the tile By Amy Kohn This necklace brings together an unlikely pair – the round, twisted jump rings and the smooth, square Tila bead. 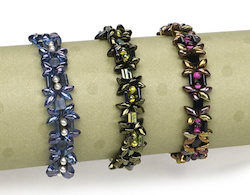 Choose size 11 and 15 seed beads in a metallic hue to match your jump rings. 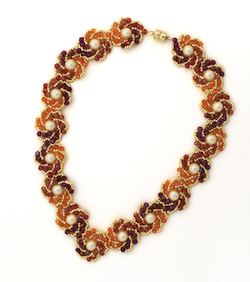 Long lines of Tila beads with glinting bicone crystals create a river of color that culminates in a delicate delta front and center. 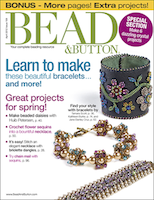 Bead Soup View Bakelite inspired jewelry, read Bead&Button's Handy-Dandy Guide to crystals, Ask Anna answers a readers question about using beaded clasps in a design, there is a book review by the editor, findings and more! Techinque Workshop: Shuttle tatting By Marilee Rockley Learn to knot beautiful lace jewelry with a convenient plastic shuttle. 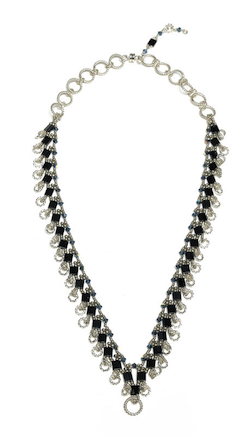 Elegant dangles By Anu Rao Nestle gemstone briolettes into a chain of crossweave stitches for a necklace that's all about fast fashion. The (not so) secret ingredients of unified design By Margie Deeb Have you every looked at a piece of jewelry and felt that its elements just weren't working together? In part two of this year-long series, we see how repetition and variety create unity. 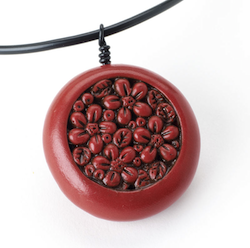 Chinese cinnabar pendant By Diane W. Villano Using an additive process, create a bead that mimics carved cinnabar. 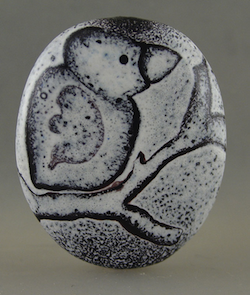 Make the core, and embellish it to create your own artistic vision. Then apply the finishing touches with antiquing medium and glaze. 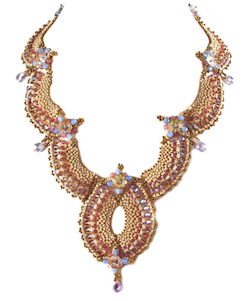 Fantastic features By Amanda Shero Granstrom Although sequins aren't strong enough to holdup in a chain mail design on their own, it's no reason to discount them as a design element. Enlarge the holes in the sequins, and pair each one with a closed ring to use in this easy weave. 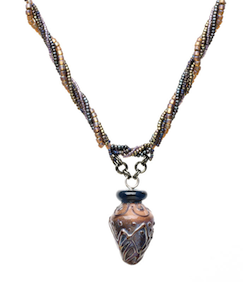 Grecian vessel By Anna Elizabeth Draeger Read about Donna Mehnert's inspiration for her lampwork bead in Spotlight Designs.